1952 BRM Mk1 V16 supercharged 485 bhp @ 12,000 rpm. A superbly detailed Limited Edition Print of 250 signed by the artist Tony Matthews. 1955 Jaguar D-type 3,442 cc 270 bhp @ 6,000 rpm. A superbly detailed Limited Edition Print of 250 signed by the artist Tony Matthews. The D-Type was built by Jaguar Cars between 1954 and 1957 and it won the Le Mans 24 Hour race three times. This was a factory built racing car that followed the C-Type and kept the same highly successful straight-6 XK engine, but uprated to 3.8 litres. It also carried on carried on with the innovative Dunlop disc brakes that had been seen on the C-Type. 1955 Mercedes-Benz W196 2,496 cc 290 bhp @ 8,500 rpm. A superbly detailed Limited Edition Print of 250 signed by the artist Tony Matthews. 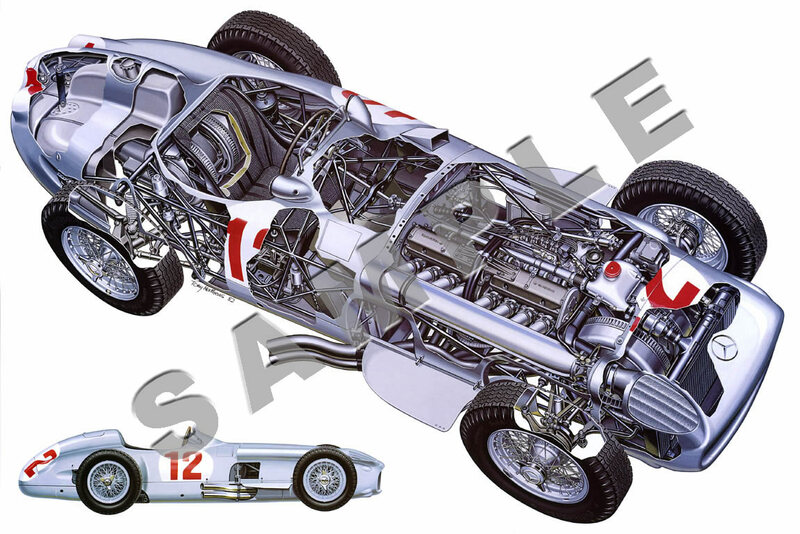 In 1954 Mercedes returned to racing and set up a department headed by Rudolf Uhlenhaut. The team was again managed by the larger than life Alfred Neubauer. The driver line up was impressive, Juan-Manuel Fangio and the Germans Karl Kling and Hans Hermann. Then in 1955 this star studded line up was joined by the young British sensation Stirling Moss. 1955 Lancia D50A 2,488 cc 260 bhp @ 8,200 rpm. 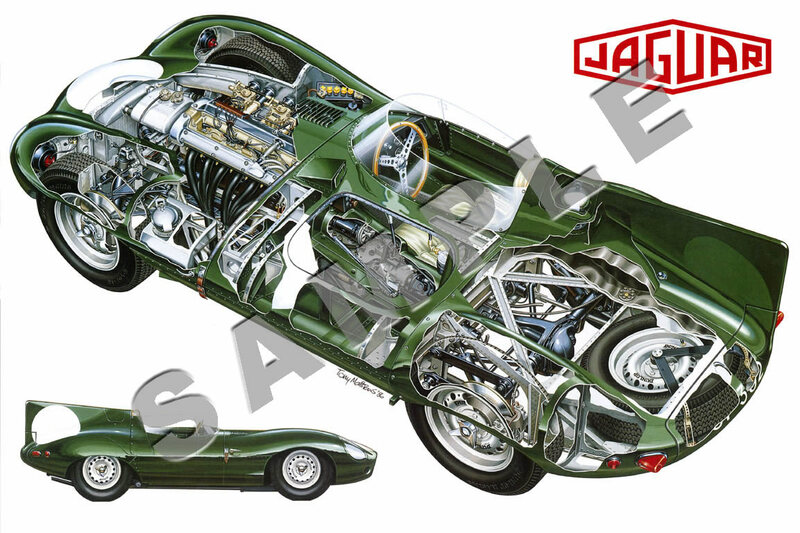 A superbly detailed Limited Edition Print of 250 signed by the artist Tony Matthews. 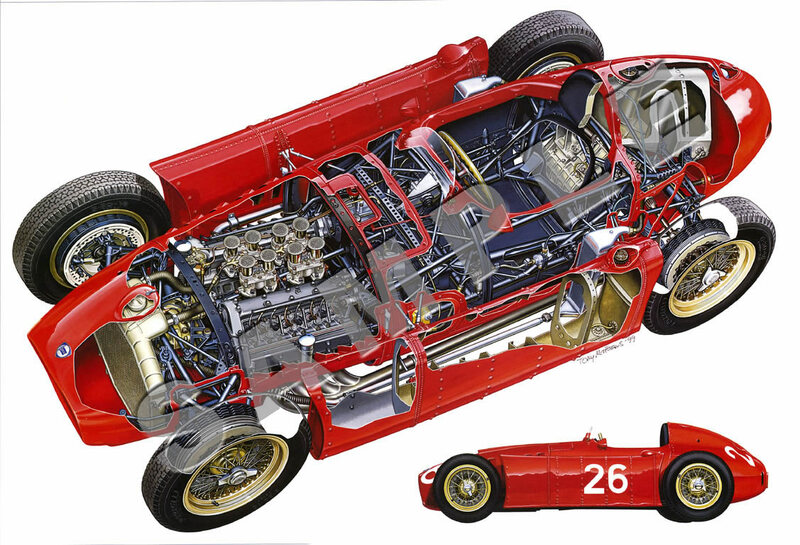 The stunning Lancia D50 was designed by Vittorio Jano and was intended to race in the 1954 Grand Prix season. In fact it only raced once that year, at the Spanish Grand Prix in Barcelona which was that season’s final round. 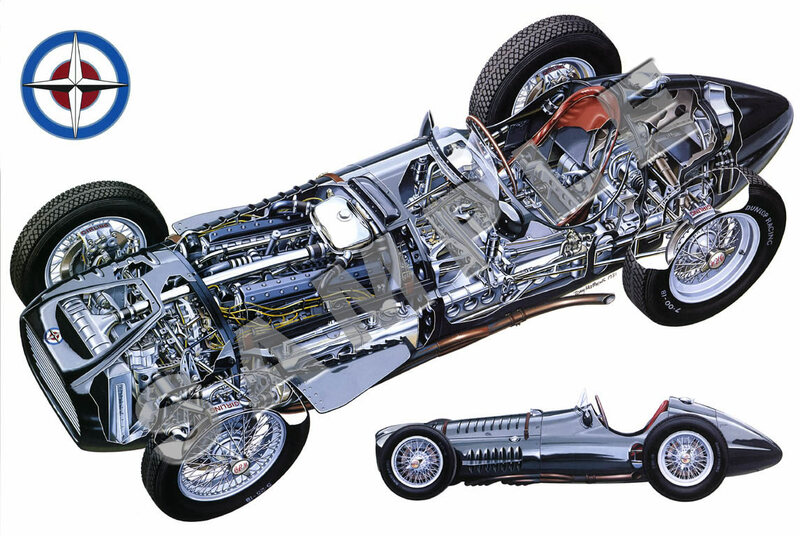 It was designed to take on the Mercedes W196 and was in fact more advanced in some ways. A Limited Edition Print of 250 signed by the artist Graham Turner. 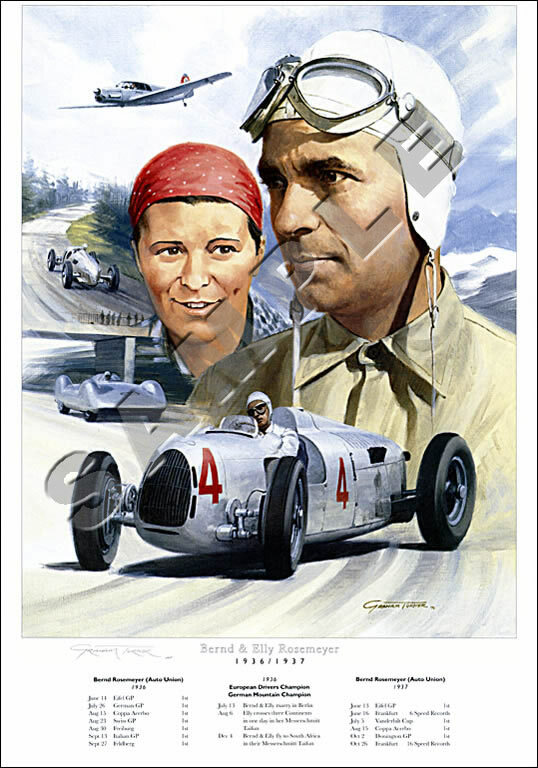 Bernd and Elly Rosemeyer were the golden couple of their era. Bernd was one of the finest GP racing drivers of all time and Elly was an immensely competent aviator. They were a hugely talented and very glamorous couple, the public and media alike loved them. Bernd and Elly married in July 1936 and earned the nickname of being ‘the fastest couple in the World’. Bernd learnt to fly and together they flew Elly’s Messerschmitt Taifun to events all over Europe and even to Africa!